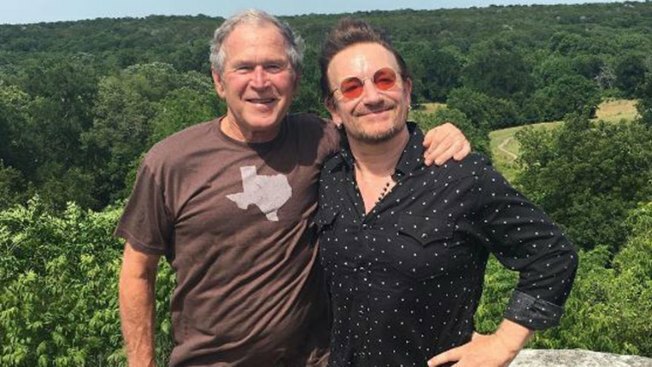 U2 frontman Bono is coming to North Texas to receive an award from former President George W. Bush. The George W. Bush Presidential Center announced Friday that he'll be the inaugural recipient of the medal for distinguished leadership. Bono is being honored for his humanitarian contributions in the area of poverty and preventable disease, particularly among the world's most vulnerable populations. Bono is not only the lead singer of U2, he's also the co-founder of ONE and (RED). "Bono's passion for ending poverty and disease is the real deal. He uses his celebrity not for personal gain, but to improve and save lives," said President Bush via an email Friday. "I am thankful for his big heart and for his leadership, and I am proud that he will be the first recipient of the Medal for Distinguished Leadership." Bono will collect his award during a three-day gathering at the George W. Bush Presidential Center in April 2018. The George W. Bush Medal for Distinguished Leadership will be award annually to an individual who has made an impact on the global community, has inspired others to action, and who has demonstrated a sustained commitment to improving the lives of others.